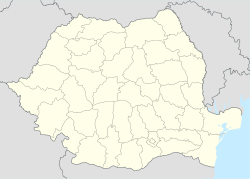 For other uses, see Galați (disambiguation). Galați (Romanian pronunciation: [ɡaˈlat͡sʲ] ( listen); also known by other alternative names) is the capital city of Galați County, in the historical region of Moldavia, eastern Romania. Galați is a port town on the Danube River. In 2011, the Romanian census recorded 249,432 residents, making it the 8th most populous city in Romania. Galați is an economic centre based around the port of Galați and the naval shipyard. The name "Galați" is derived from the Cuman word galat. This word is borrowed from the Arabic word قَلْعَةٌ qalʿat, "fortress". Other etymologies have been suggested, such as the Serbian galac. However, the galat root appears in nearby toponyms, some of which show clearly a Cuman origin, for example Gălățui Lake, which has the typical Cuman -ui suffix for "water". Another toponym in the region is Galicia, with its town of Halych, locally associated with the jackdaw (Kawka, Halka). Before the Mongol invasion of Rus, Galați was known as Malyi Halych (Little Halych) as part of the Kingdom of Galicia–Volhynia. Other similar place names are Galich, Russia and Galatia in Turkey. Galați has several exonyms: Greek: Γαλάτσι (Galatsi); German: Galatz; Hungarian: Galac; Polish: Gałacz; Turkish: Kalas; Bulgarian: Галац (Galats); Ukrainian: Галац (Halats) and Russian: Галац (Galats). There is evidence of continuous inhabitation of Galați since the 600s. A treasure hoard consisting of 12 silver coins issued between 613 and 685 was found in a Byzantine tomb near the Church of the Virgin. Western and Byzantine coins from the time of Emperor Michael IV (1034–1041) were also found. At one time[when? ], the city became part of the Republic of Genoa Territories and was called "Caladda". In 1445, a document signed by Stephen II of Moldavia mentions Galați. In 1484, Chilia was conquered by Ottomans. Galați township remained Moldova's only port, not only for domestic trade but also for trade with Turkey and Poland. In 1590, the Galați Jewish cemetery was opened. Galați remained under Romanian control during World War I. Romanian soldiers fought alongside those of Russia against the army of the Central Powers. Galați was bombed by retreating Russian troops in January 1918. Galați has a hot-summer humid continental climate (Köppen climate classification Dfa). Galați has a continental climate (Köppen climate classification "Dfa" – summer warmer than winter, European subtype) with four distinct seasons. Summers are very warm with temperatures sometimes exceeding 35 °C (95 °F) while winters are cold and dry with temperatures at night sometimes dropping below −10 °C (14 °F). Average monthly precipitation ranges from about 28 to 68.6 mm (1.1 to 2.7 in) in June. The museum was inaugurated on 24 January 1939. This was the 80th anniversary of the union of the Romanian principalities. It is housed in the residence of Cuza, Galați's chief magistrate. In 1951, after World War II, scientific activity resumed at the museum. In 1956, some items were donated to the Natural History museum and the museum of art. The finds from Tirighina-Bărboși are housed in this museum. Arcelor-Mittal Steel Works in 2006. Galați railway station has straight train services to cities such as Bucharest, Cluj-Napoca, Brașov and Iași all year and in the summer to Constanța. Public transport in Galați is provided by a combination of trams, trolleybuses, autobuses (all of which are operated by TRANSURB, an agency of the municipality). Explosion (1973) is a communist film made entirely in Galați. It is based on the true story of an incident where a Panamanian vessel, loaded with ammonium nitrate, threatened to explode and destroy Galați and Brăila. In Bram Stoker's novel Dracula, Galați ("Galatz") is the port at which Count Dracula disembarked on his way back to Transylvania. ^ "Population at 1 January 2015". Eurostat. Retrieved 3 November 2017. ^ "Populaţia României pe localitati la 1 ianuarie 2016" (in Romanian). INSSE. 6 June 2016. Retrieved 3 November 2017. ^ Apostol, Marlena. "UNION OF ROMANIAN INLAND PORTS". www.danube-ports.ro. ^ Arkas, M. Istorii︠a︡ Ukraïny-Rusi. [History of Ukraine-Ruthenia]. "Obshchestvennaia Polza" Publishing. 1908. ^ "Map of Repubblica di Genova". ^ Stoica, Vasile (1919). The Roumanian Question: The Roumanians and their Lands. Pittsburgh: Pittsburgh Printing Company. p. 88. ^ ""Mogosoaia" - mormantul din Dunare". ^  "Ships crash on Danube" Associated Press. 11 September 1989. Accessed 8 July 2012. ^ "CLIMAT summary for 15310: Galati (Romania) – Section 2: Monthly Normals". CLIMAT monthly weather summaries. Ogimet. Retrieved July 25, 2017. ^ "Galați Climate Normals 1961-1990". National Oceanic and Atmospheric Administration. Retrieved March 21, 2015. ^ "Klimatafel von Galatz (Galati) / Donau, Moldau (Bessarabien) / Rumänien" (PDF). Baseline climate means (1961-1990) from stations all over the world (in German). Deutscher Wetterdienst. Retrieved November 23, 2016. ^ "Robescu House, Galati, Romguide tourism Romania". www.romguide.net. Archived from the original on 2016-03-03. Retrieved 2019-01-05. ^ pocan_marian@yahoo.com. "NAVROM - Compania de navigatie fluviala romana". www.navrom.ro. ^ a b c Cilincă, Victor (11 July 2015). ""Comori de patrimoniu": Biserica "Sf. Pantelimon", o Atlantidă bulgărească pe o insulă a libertăţii". Viaţa Liberă (in Romanian). Retrieved 10 January 2016. ^ ActiveSoft, Developed by. "Schitul Vovidenia - Neamt". www.crestinortodox.ro. ^ a b c d e f g h i "Harti Din Galati, Harta Galati Blocuri, Strazi - Tiglina 1, 2, 3 - Mazepa 1, 2 - Micro 13, 39, 40, 16, 17, 18, 19, 20, 21, 38, Zona Port". anunturigalati.ro. ^ "The Poseidon Explosion". 24 August 1973 – via www.imdb.com.